Structural racism. Food insecurity. Long-term health care. Systemic change in these areas can feel intimidating, too large for one organization to tackle alone. But Ben Kofoed ’12 and Perran Wetzel V ’13 of the Collective Action Lab in Minneapolis aren’t afraid to dive in and help make it happen. Perran Wetzel V ’13 (left) and Ben Kofoed ’12 work at the Collective Action Lab, an organization that addresses complex social challenges and facilitates big-picture systemic change. 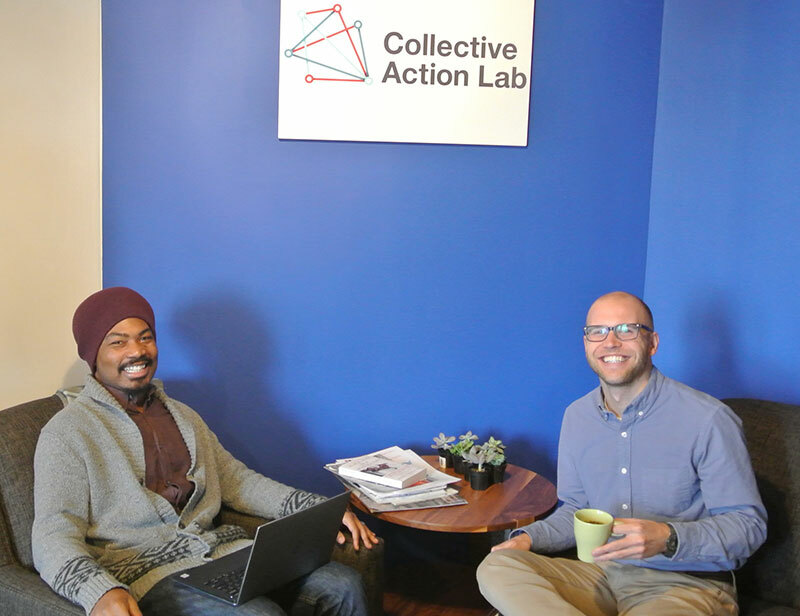 The Collective Action Lab is a uniquely modern enterprise. Its small, agile staff partners with community groups to address complex social challenges. Sometimes this means helping to draft a strategic plan. Sometimes it means research, grant proposal writing, project management, or facilitating communication between stakeholders. Kofoed explains: “Our organization recognizes that in order to tackle the big problems, collaboration between sectors or different organizations is really important, and it’s really hard to do that well. A lot of times people come together in grand ideas and projects and it doesn’t work out because everyone has a day job and it lacks this sort of backbone support to sustain it. The Collective Action Lab tries to serve as that supporting infrastructure. Kofoed, a biology major, came to the Lab after earning a graduate degree in public health from the University of Minnesota and working for over a year in local public health administration in the northern part of the state. “So where I was doing really basic administration of public health programs,” he says, “the Lab was working on big-picture change around the health care space. It was an opportunity to do what drew me to studying public health policy but work on it in a much bigger way.” Kofoed has played a large part in initiatives such as Silos to Circles, which brings health care organizations together to share learning, pilot new ideas, and generally think about health care questions in innovative ways. Wetzel, an anthropology major, came to the Lab after he and his wife, Emily Griffin-Wetzel ’14, moved to Minneapolis from Chicago, where he’d been a teacher’s aide and substitute teacher at a special-needs school. When the Lab’s founder, Olivia Mastry, offered him a position, he jumped at the opportunity to be part of large-scale change. Wetzel and Kofoed are also engaged in additional collaborations, such as the Minnesota Hunger Initiative, a network of more than twenty hunger-relief organizations currently working to explore new and compelling ways of understanding need and new models for hunger relief. Wetzel also points to his anthropology background as good preparation for facilitating conversations and engaging small groups on difficult subjects, a skill that Kofoed also picked up at Luther.